#BOMTC Alma 14-16: Not Shrinking Is Much More Important Than Surviving! The accounts in Alma 11–16 illustrate the sacrifices people are willing to make for their testimony of the truth. As Alma and Amulek began teaching the people of Ammonihah, they met with opposition. After they explained several eternal truths, many people “began to repent, and to search the scriptures” (Alma 14:1), including Zeezrom. However, most of the people were angry and sought to destroy Alma, Amulek, and those who believed in their words. Alma and Amulek warned the people of Ammonihah that if they failed to repent, the judgments of God would come upon them. Alma and Amulek were arrested, tried, and eventually imprisoned. The wicked people in Ammonihah cast out the men who believed Alma and Amulek, and burned their wives, children, and scriptures while Alma and Amulek were forced to watch. After many days, the Lord delivered Alma and Amulek from prison and destroyed the wicked leaders of Ammonihah. Once the Lord delivered Alma and Amulek from prison, they went to preach to the people in the city of Sidom. There they found the believers who had been cast out of Ammonihah, including Zeezrom, who was suffering physically and spiritually because of his sins. When Zeezrom declared his faith in Jesus Christ, Alma healed him and baptized him. Alma established the Church in Sidom, and then returned with Amulek to Zarahemla. Rejecting the call to repent, the people of Ammonihah were later destroyed by a Lamanite army, fulfilling Alma’s prophecy that the city of Ammonihah would be destroyed in a single day. In addition, the Lamanites captured some of the Nephites from the surrounding lands. Choosing to follow Alma’s prophetic guidance, the Nephite armies recovered the prisoners and drove the Lamanites from the land. During a period of peace, Alma, Amulek, and many others strengthened the Church throughout the land of the Nephites. Finding faith in the Lord Jesus Christ will help us have the power to endure and overcome even the hardest trials in life. 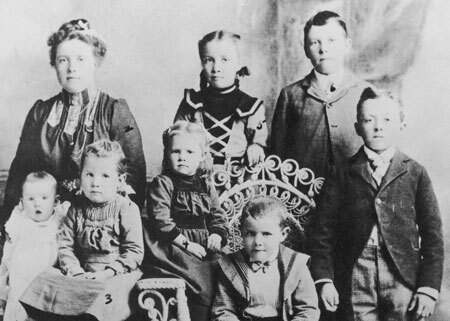 Spencer W. Kimball and his siblings, about two years before his sister Fannie died. Standing, left to right: Clare, Ruth, Gordon, and Delbert. Seated, left to right: Helen, Alice, Fannie, and Spencer. In His wisdom, God does not always prevent tragedy. Two automobiles crashed when one went through a red light, and six people were killed. Why would God not prevent this? Why should the young mother die of cancer and leave her eight children motherless? Why did not the Lord heal her? A little child was drowned; another was run over. Why? I wish I could answer these questions with authority, but I cannot. I am sure that sometime we’ll understand and be reconciled. But for the present we must seek understanding as best we can in the gospel principles. Was it the Lord who directed the plane into the mountain to snuff out the lives of its occupants, or were there mechanical faults or human errors? Did our Father in heaven cause the collision of the cars that took six people into eternity, or was it the error of the driver who ignored safety rules? Did God take the life of the young mother or prompt the child to toddle into the canal or guide the other child into the path of the oncoming car? Did the Lord cause the man to suffer a heart attack? Was the death of the missionary untimely? Answer, if you can. I cannot, for though I know God has a major role in our lives, I do not know how much he causes to happen and how much he merely permits. Whatever the answer to this question, there is another I feel sure about. Could the Lord have prevented these tragedies? The answer is, Yes. The Lord is omnipotent, with all power to control our lives, save us pain, prevent all accidents, drive all planes and cars, feed us, protect us, save us from labor, effort, sickness, even from death, if he will. But he will not. We should be able to understand this, because we can realize how unwise it would be for us to shield our children from all effort, from disappointments, temptations, sorrows, and suffering. With an eternal perspective, we understand that adversity is essential to our eternal progression. If we looked at mortality as the whole of existence, then pain, sorrow, failure, and short life would be calamity. But if we look upon life as an eternal thing stretching far into the premortal past and on into the eternal post-death future, then all happenings may be put in proper perspective. Is there not wisdom in his giving us trials that we might rise above them, responsibilities that we might achieve, work to harden our muscles, sorrows to try our souls? Are we not exposed to temptations to test our strength, sickness that we might learn patience, death that we might be immortalized and glorified? If all the sick for whom we pray were healed, if all the righteous were protected and the wicked destroyed, the whole program of the Father would be annulled and the basic principle of the gospel, free agency, would be ended. No man would have to live by faith. If joy and peace and rewards were instantaneously given the doer of good, there could be no evil—all would do good but not because of the rightness of doing good. There would be no test of strength, no development of character, no growth of powers, no free agency, only satanic controls. Should all prayers be immediately answered according to our selfish desires and our limited understanding, then there would be little or no suffering, sorrow, disappointment, or even death, and if these were not, there would also be no joy, success, resurrection, nor eternal life and godhood. On the other hand, these things can crush us with their mighty impact if we yield to weakness, complaining, and criticism. The power of the priesthood is limitless but God has wisely placed upon each of us certain limitations. I may develop priesthood power as I perfect my life, yet I am grateful that even through the priesthood I cannot heal all the sick. I might heal people who should die. I might relieve people of suffering who should suffer. I fear I would frustrate the purposes of God. Had I limitless power, and yet limited vision and understanding, I might have saved Abinadi from the flames of fire when he was burned at the stake, and in doing so I might have irreparably damaged him. He died a martyr and went to a martyr’s reward—exaltation. I fear that had I been in Carthage Jail on June 27, 1844, I might have deflected the bullets that pierced the body of the Prophet and the Patriarch. I might have saved them from the sufferings and agony, but lost to them the martyr’s death and reward. I am glad I did not have to make that decision. With such uncontrolled power, I surely would have felt to protect Christ from the agony in Gethsemane, the insults, the thorny crown, the indignities in the court, the physical injuries. I would have administered to his wounds and healed them, giving him cooling water instead of vinegar. I might have saved him from suffering and death, and lost to the world his atoning sacrifice. Death can open the door to glorious opportunities. We know so little. Our judgment is so limited. We judge the Lord’s ways from our own narrow view. I spoke at the funeral service of a young Brigham Young University student who died during World War II. There had been hundreds of thousands of young men rushed prematurely into eternity through the ravages of that war, and I made the statement that I believed this righteous youth had been called to the spirit world to preach the gospel to these deprived souls. This may not be true of all who die, but I felt it true of him. In times of trial, we must trust in God. Despite the fact that death opens new doors, we do not seek it. We are admonished to pray for those who are ill and use our priesthood power to heal them. “And the elders of the church, two or more, shall be called, and shall pray for and lay their hands upon them in my name; and if they die they shall die unto me, and if they live they shall live unto me. “Thou shalt live together in love, insomuch that thou shalt weep for the loss of them that die, and more especially for those that have not hope of a glorious resurrection. “And they that die not in me, wo unto them, for their death is bitter. We are assured by the Lord that the sick will be healed if the ordinance is performed, if there is sufficient faith, and if the ill one is “not appointed unto death.” But there are three factors, all of which should be satisfied. Many do not comply with the ordinances, and great numbers are unwilling or incapable of exercising sufficient faith. But the other factor also looms important: If they are not appointed unto death. God controls our lives, guides and blesses us, but gives us our agency. We may live our lives in accordance with his plan for us or we may foolishly shorten or terminate them. I am positive in my mind that the Lord has planned our destiny. Sometime we’ll understand fully, and when we see back from the vantage point of the future, we shall be satisfied with many of the happenings of this life that are so difficult for us to comprehend. We knew before we were born that we were coming to the earth for bodies and experience and that we would have joys and sorrows, ease and pain, comforts and hardships, health and sickness, successes and disappointments, and we knew also that after a period of life we would die. We accepted all these eventualities with a glad heart, eager to accept both the favorable and unfavorable. We eagerly accepted the chance to come earthward even though it might be for only a day or a year. Perhaps we were not so much concerned whether we should die of disease, of accident, or of senility. We were willing to take life as it came and as we might organize and control it, and this without murmur, complaint, or unreasonable demands. 1. In Edward L. Kimball and Andrew E. Kimball Jr., Spencer W. Kimball(1977), 43. 2. In Spencer W. Kimball, 46. 3. In Spencer W. Kimball, 46. 4. Joseph Robinson, in Spencer W. Kimball, 46. 5. The Teachings of Spencer W. Kimball, ed. Edward L. Kimball (1982), 40–41. 6. Faith Precedes the Miracle (1972), 95–96. 7.Faith Precedes the Miracle, 97–100. 8.Faith Precedes the Miracle, 100, 101, 102. 9.Faith Precedes the Miracle, 102–3, 105–6. The accounts in Alma 11–16 illustrate the sacrifice people are willing to make for their testimony of the truth. As Alma and Amulek began teaching the people of Ammonihah, they met with opposition. After they explained several eternal truths, many people “began to repent, and to search the scriptures” (Alma 14:1), including Zeezrom. However, most of the people were angry and sought to destroy Alma, Amulek, and those who believed in their words. Alma and Amulek warned the people of Ammonihah that if they failed to repent, the judgments of God would come upon them. Alma and Amulek were arrested, tried, and eventually imprisoned. #BOMTC Day 40, May 16~Alma 14-16 or Pages 245-251: Not Shrinking Is Much More Important Than Surviving! The accounts in Alma 11–16 illustrate the sacrifice people are willing to make for their testimony of the truth. As Alma and Amulek began teaching the people of Ammonihah, they met with opposition. After they explained several eternal truths, many people “began to repent, and to search the scriptures” (Alma 14:1), including Zeezrom. 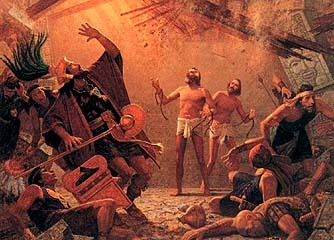 Most of the people were angry and sought to destroy Alma, Amulek, and those who believed in their words. Alma and Amulek warned the people of Ammonihah that if they failed to repent, the judgments of God would come upon them. Alma and Amulek were arrested, tried, and eventually imprisoned. The wicked people in Ammonihah cast out the men who believed Alma and Amulek, and burned their wives, children, and scriptures while Alma and Amulek were forced to watch. After many days, the Lord delivered Alma and Amulek from prison and destroyed the wicked leaders of Ammonihah. After the Lord delivered Alma and Amulek from prison, they went to preach to the people in the city of Sidom. There they found the believers who had been cast out of Ammonihah, including Zeezrom, who was suffering physically and spiritually because of his sins. When Zeezrom declared his faith in Jesus Christ, Alma healed him and baptized him. Alma established the Church in Sidom, and then returned with Amulek to Zarahemla. Rejecting the call to repent, the people of Ammonihah were later destroyed by a Lamanite army, fulfilling Alma’s prophecy that the city of Ammonihah would be destroyed in one day. In addition, the Lamanites captured some of the Nephites from surrounding lands. Choosing to follow Alma’s prophetic guidance, the Nephite armies recovered the prisoners and drove the Lamanites from the land. During a period of peace, Alma, Amulek, and many others strengthened the Church throughout the land of the Nephites. The wicked people in Ammonihah cast out the men who believed and burned their wives, children, and scriptures while Alma and Amulek were forced to watch. After many days, the Lord delivered Alma and Amulek from prison and destroyed the wicked leaders of Ammonihah. After the Lord delivered Alma and Amulek from prison, they went to preach to the people in the city of Sidom. There they found the believers who had been cast out of Ammonihah, including Zeezrom, who was suffering physically and spiritually because of his sins. When Zeezrom declared his faith in Jesus Christ, Alma healed him and baptized him. Alma established the Church in Sidom, and then he returned with Amulek to Zarahemla. Rejecting the call to repent, the people of Ammonihah were later destroyed by a Lamanite army, fulfilling Alma’s prophecy that the city of Ammonihah would be destroyed in one day. In addition, the Lamanites captured some of the Nephites from surrounding lands. Choosing to follow Alma’s prophetic guidance, the Nephite armies recovered the prisoners and drove the Lamanites from the land. During a period of peace, Alma, Amulek, and many others strengthened the Church throughout the land of the Nephites.